Bethesda says the PC version of Wolfenstein: The New Order will be regionally locked to keep it from being activated in Germany. It's no secret that Germany has some rather strict laws regulating the display of Nazi symbols, with penalties for those who violate them ranging from hefty fines to prison time. You can see how that would be a problem for the Wolfenstein franchise, which is all about fighting Nazis, because the fact that they're the bad guys carries no weight in the eyes of German authorities. It's no surprise, then, that the German version of the game will be about "The Regime" rather than Nazis, as Bethesda's Pete Hines explained last month, and that all Nazi-related content has been stripped from that edition of the game. But today, the publisher announced that it's going even farther to protect itself by taking steps to keep the international version of The New Order - which is to say, the one with all the Nazi stuff - out of the country. "In order to prevent any digital copies of the international version from being sold, exported, imported or distributed into Germany, PC versions will be geo-locked so that they cannot be activated within Germany," the publisher announced today. "On the basis of legal advice and industry standard practice, we are also not making the international version available for sale in Austria." 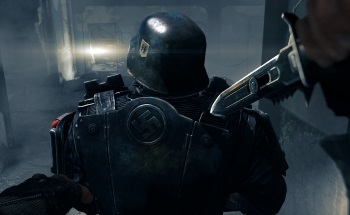 The German-language version of Wolfenstein: The New Order will be available in other parts of the world for those who want it, although Bethesda noted that the changes relate to "Nazi content only," and that "although there are some legally required differences, the levels of violence and action remain the same as in the international version." Wolfenstein: The New Order comes out on May 20 for the Xbox 360, Xbox One, PlayStation 3, PlayStation 4 and PC.